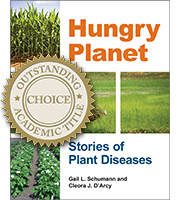 Hungry Planet named "Outstanding Academic Title" by Choice magazine! currently an adjunct professor at Marquette University in Milwaukee, Wisconsin. M.S. and Ph.D. degrees in plant pathology from the University of Wisconsin–Madison. ethics, and teaching methods for undergraduates, graduate students, and new faculty. Dr.
of The American Phytopathological Society and the American Association for the Advancement of Science. This comprehensive book delivers everything we have come to appreciate and expect from a Schumann and D’Arcy offering. It tells the stories of plant pathology with a passionate voice and laces each tale with the essential research-based information to help readers understand the interrelationship between agriculture, the human condition, and the science that connects the two. The book examines the effects plant diseases have had on human culture by weaving together true-life tales from ancient days and modern times. Hungry Planet explores sometimes controversial topics that challenge readers to think beyond the disease outbreaks to consider the impact these biological events have on our personal lives. Anyone interested in science, environmental issues, food production, or sustainability will find the book fascinating. 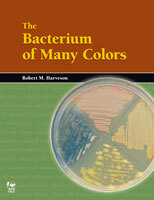 This clearly written book is an ideal entry-level text for inquisitive college students who are majoring in a subject other than plant pathology, especially those in general education and core science classes. There is a student resources website organized around the book’s topics that will help bring the stories of plant diseases to life through podcasts, exercises, and other teaching tools. For those teaching with this book, there is an instructor’s-only web interface with resources that will be your course guide throughout the semester. If you wish to build a course around Hungry Planet, these award-winning educators have already done the preparation work for you—it is only a click away on APSnet. Anyone who has taught a course with Schumann’s earlier book, Plant Diseases: Their Biology and Social Impact will find Hungry Planet to be an amazing update of one of the perennial favorites among APS PRESS books. Controversial and complex topics such as pesticide use and genetic engineering are presented in a real-world context, encouraging the reader to apply critical thinking. Descriptions of the impact of plant diseases on where and how crops are grown give gardeners, students, and anyone with an interest in science or agriculture, a comprehensive and approachable presentation of the subject matter. The relationship of plant diseases and the food supply is emphasized, so that readers gain a better understanding of the connections between the two. A historical and sometimes political context is used to present the development of agriculture, giving the reader a perspective on the people who, throughout history , were trying to understand the world around them and secure a reliable food supply. These Student Resources complement the printed book. Each chapter includes an Image Gallery with color images. Words to Know are individually linked to an online illustrated glossary. Additional print and Internet resources are listed. Each short podcast discusses a major concept or issue, clarifies a particular point of confusion, and offers review questions. Finally, questions for discussion may be used to continue the conversation after reading the chapter. Many free instructor resources, written by the authors themselves, give instructors ideas for teaching assignments and shorten the prep time needed for lesson plans and lectures. Hungry Planet is designed as a textbook for general education or core courses in biology for nonscience major undergraduates. It teaches basic biological concepts within a framework of stories of plant diseases. Such a course should help students become more aware of the importance of plants and agriculture in their everyday lives and the challenges of providing food, fiber and fuel for a growing population. These Instructor Resources include many exercises successfully used by the authors. Instructors are invited to use these resources as classroom exercises or to get ideas for additional exercises. In addition, there are many peer-reviewed sources of information related to plant diseases for students, including an illustrated glossary, in other sections of the APSnet Education Center. Student Resources for each chapter of Hungry Planet also are available on this site. Educators may review Hungry Planet: Stories of Plant Diseases for consideration as a course textbook. Educators inside the U.S. - Examine the book free for 60 days with no obligation to purchase. You will receive the book along with an invoice. If you choose to keep the book, but not adopt it for your class, simply pay the invoice. If you choose to adopt the book for your class, keep the book with compliments of APS PRESS when you write “Complimentary Desk Copy” on your invoice and return it with a photocopy of your bookstore order or bookstore requisition form for 10 or more copies of the textbook. If you decide not to adopt the book for your class and you do not wish to keep the book for your personal use, simply return the book with a copy of your invoice and write cancel on the invoice. Educators outside the U.S. – Purchase the book online now and if you choose to adopt the book for class, e-mail or mail a photocopy of your bookstore order or bookstore requisition form for 10 or more copies of the textbook and APS PRESS and ask APS PRESS to provide a refund for the book. If you decide not to adopt the book for your class and you do not wish to keep the book for your personal use, simply return the book with a copy of your invoice within 60-days of the order date and write cancel on the invoice. You will receive a refund for the price of the book. Contact APS PRESS Customer Care to request a 60-day examination copy. Call 1.800.328.7560 U.S. and Canada (+1.651.454.7250 elsewhere) or send an e-mail to aps@scisoc.org. Please include name of course, name of institution, your name, address, phone number, e-mail address, and the name of the book. Please note: Kindle Edition is not available for 60-day evaluation. plant gene pools and how to stay one step ahead of the numerous pathogens that can destroy plants. studies of epidemics and the ecology of agriculture. Genetic studies have led to the development of disease-resistant crops, as well as the ability to manipulate plant and pathogen genes through genetic engineering. Biological concepts from these scientific fields are introduced along the way, and more technical information is found in the Science Sidebars in various chapters. and fuel? How do we foster plant health in a world dominated by people? 1991. Both books reflect our experiences as instructors of general education courses designed to enhance the scientific and agricultural literacy of university students. "This very readable book is a valid attempt to combine an introductory plant pathology textbook for undergraduate students into a book with the potential for more general readership…a very valuable and well-constructed introductory book…the authors are to be congratulated on their comprehensive coverage of the subject." "...well-written and provides an interesting and informative read. Highly recommended...packed full of examples to illustrate important points...this book does a superb job of introducing readers to plant pathology." "Two experienced Emerita Professors in plant pathology present this remarkable publication, which deserves attention far beyond a readership in plant protection only. In 14 informative chapters, they not only cover the biology and impact of important plant diseases, but give a wealth of additional information. The very broad scope, which is covered by this publication and the up-to-date information about acute problems and approaches to solve these, makes this book very interesting reading. It deserves broad attention, not only from students in agriculture, but also from others interested in environmental issues and can be highly recommended."